Made in Canada, the 1 lb. 9 oz. ductile cast iron plane is based on a 1850 Edward Preston design. A channel in the 8″ long sole of the plane keeps the wood from straying away from the O1 tool steel blade. 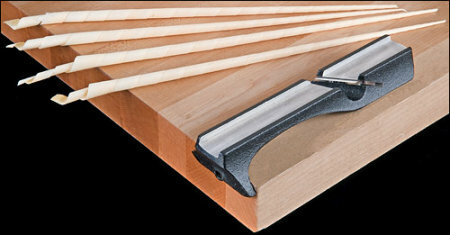 A 1/2″ tall by 2-1/2″ wide fence butts against the edge of a table while you’re sliding a 5/8″ to 3/4″ wide piece of straight-grained softwood over the plane. You can also mount the plane to a block of wood so you can clamp it in a vise. Lee Valley’s spill plane will run you $49 before shipping and when you need a replacement blade you’ll shell out another $10. If you want to make one yourself I found a good set of instructions with excellent pictures by Darrell LaRu on the WK Fine Tools Site or, if you can find the episode, Roy Underhill made one on the Woodwright’s Shop. While I really like LV tools, I think I’ll pass on this one. Wood shavings make great kindling, but I don’t need something that will allow me to transport a flame from the fireplace to a candle. If I ever want to pretend it’s the 1800s, I’ll just set my jack for a thick shaving – voila a spill. I wonder how many of these they’ll actually sell. Now their new mini shoulder plane is pretty cool. @Gary, Can you set your jack plane to produce a long, tight shaving? I can’t. But like you, I don’t need to transfer flames that way. That photo from LV has been photoshopped to remove the shadow under the curved section of the plane for some reason. I can think of 2 uses – my old gas BBQ and my wood stove – both need a long reach lighter such as a spill to position the flame and use less matches. Forget about the butane lighters – they’re always empty when you need them most!